“See, Click, Fix” Your Way to an Active Neighborhood! “I’d love to take a run but the sun is about to set and the street isn’t well-lit… probably too dark. My son loves to ride his scooter but the sidewalk around here just isn’t good enough… too easy for him to trip or fall. Common complaints here in RVA! In a city of 200,000+ people, our streets, sidewalks, and city infrastructure can wear out, break down, and become troublesome. And when that happens, some real barriers to active living can crop up! But never fear, Richmonders! “See Click Fix” is here! You see an issue! A crumbling sidewalk, an overflowing trashcan, a flickering streetlight. You report the issue! 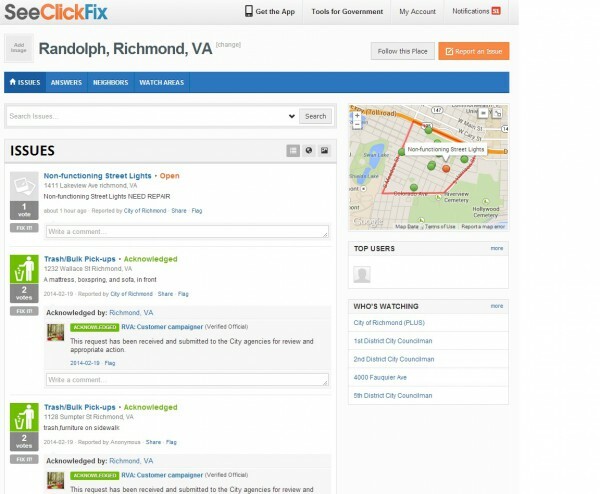 See Click Fix’s website has a simple interface for creating “issue reports” tagged to specific intersections or addresses and includes the opportunity to upload a photo! The city sees your issue! The city’s DPW, MPACT committee, and others monitor the site and are able to respond, clarifying what’s wrong and directing the problem to the municipal team best suited to address it. Your neighbors see the issue and vote on it! There are thousands of users on See Click Fix and if they agree – “that pothole should be fixed!” – they can essentially +1 your post, boosting its importance. By in large, it’s a remarkably effective system! While See Click Fix doesn’t have the solution to every street-level squabble, it’s got a great track record when it comes to most of the things that might interfere with your weekly run, bike ride, or walk around the block. Active living isn’t all about winning races or lifting weights. It’s about our daily routines and integrating movement, play, and exercise wherever we can. Keeping our neighborhoods safe, clean, and crumbling-sidewalk-free is a part of that equation! Get on See Click Fix and play around. It’s one simple way to become an advocate for everyone’s active lifestyle in RVA.